A level surface 91' long and 13' wide with side and back walls accommodates all styles of play including the "Open Rules" and both recognize international disciplines. 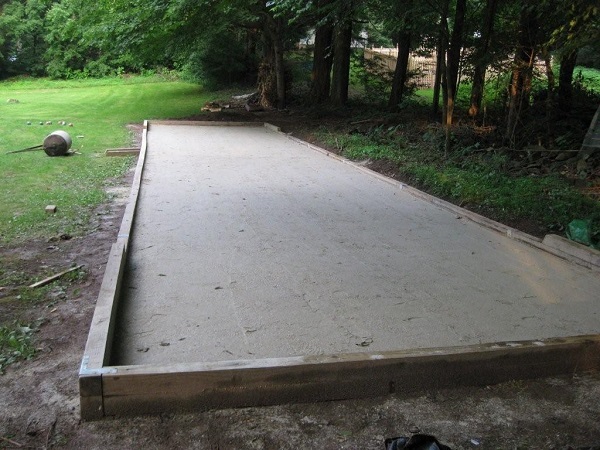 If you are planning to build a personal court for recreational use for you, your family and friends then the size should be whatever fits in your backyard. I recommend the internationally approved 91'x13' court because it provides the most flexibility. 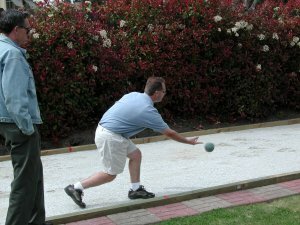 Your court will then be regulation size regardless of the style of game you play, and you can begin training for the U.S. Bocce Team. Side walls and back walls are desirable. They should be constructed of wood, preferably sunken treated wood or bolted to concrete walls to provide resilience. Walls may, however, also be constructed above ground. As long as you have space you could build a court anywhere. If you wanted to play in the middle of the ocean you could check out Azimut Yachts for sale and find a yacht that had enough room for the perfect bocce courts. The court surface should be relatively smooth and level. 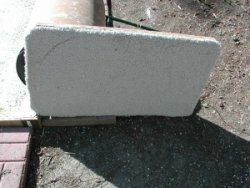 A packed hard surface should be accomplished with a mixture of clay and oyster shell flour, limestone or decomposed granite dust. Synthetic surfaces are being developed which minimize maintenance. Carpet may also be used. And, if you do not have a court, just play anywhere. Grass, sand, dirt... you'll still have fun! 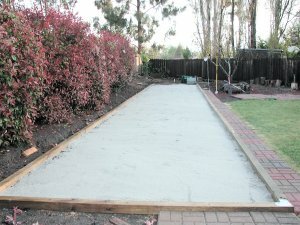 So I'm finally constructing my own bocce court. 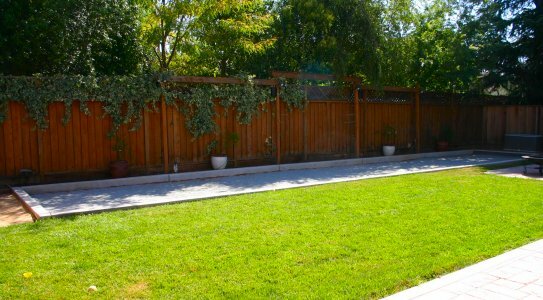 I definitely have a large enough yard. I was waiting for the wet weather to be over here in Northern California. Here is one of the before pictures. I had huge help from my brother-in-law! He used stakes, string and a string level. The area is 10'x60' and the frame is made from pressure treated 4x4 posts. Luckily I had a pile of left over red lava rock (from the previous owners) to use for fill on the low spots. Here is a before and after picture. The before (on the left) is the opposite view from the picture above. The frame is not complete and it needs to be rolled. 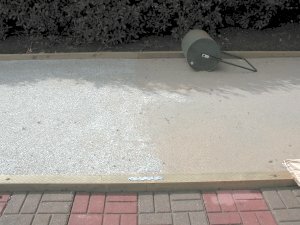 The after (on the right) is the result of using a roller and scraping away the high spots and filling in the low spots. I have one more post to attach and anchor. 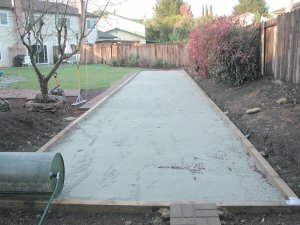 I've attached all the posts together and started using 14x14 inch steps to create a walkway around the court. It looks much better this way and hopefully will keep people from stepping on the posts themselves. I ordered 2 yards of masonry sand. I may (or may not) need one more yard of sand depending on how I can even out the surface. At first I didn't think I had enough to cover the court at all, but after buying a good rake (see below) to spread it out, its looking pretty good. 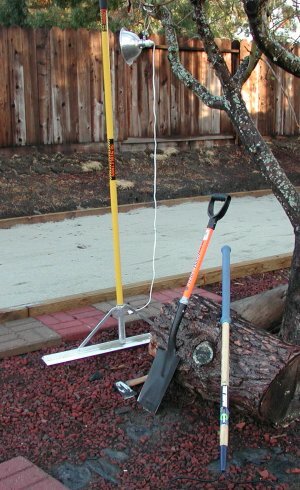 Here are some of tools I've been using to help complete the court. Above you see a 'Lawn Roller'. It fills up with water and flatten things out pretty well. I'll use this after construction to. It's a great tool for court preparation. In the other picture you'll see a flat edged rake, seen mostly at baseball fields, it is great for leveling the sand and packing down places that the roller has difficulty. The flat head shovel was great to scrape turf or dirt where needed. And the garden rake was nice for moving dirt and rock. NOTE: Yes, that is a shop light in the tree...I only had one night this week to put the sand in and rake it. Here is a homemade tool that made this process a lot easier. 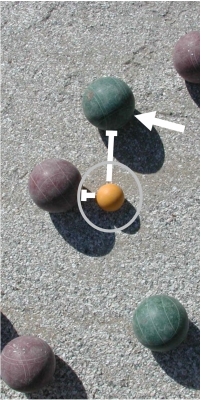 The pictures you see above is a bocce court drag. 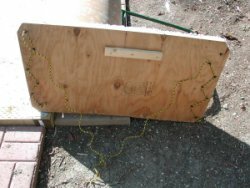 It's made out of thick plywood, rope and carpet. The carpet side faces down on the court. Then you use the rope to pull the drag. The thick plywood has enough weight to smooth out areas of the court (picking up material at high spots and dropping material in low spots). It is great for court preparation and after-game maintenance. I dropped by the local Feed and Grain store and picked up their only two bags of crushed oyster shell (50lb bags). I limited myself to one bag per 10ft of court. That seems to workout perfectly. I found another feed store not far away to pick up the rest of oyster shells. By the time I picked up the shells and placed them next to the court the rain started to fall. And it didn't stop all day...or all night. In the pictures above you can tell that the court is still a bit wet. I'm waiting for it to dry and put the shells on tonight. 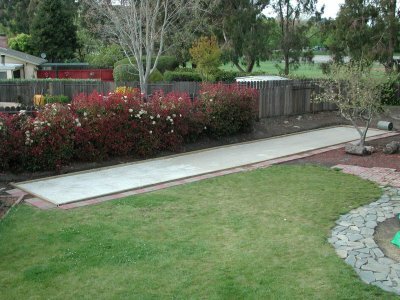 You'll also notice that I finished the walkway around the outside of the court. Hopefully this will keep people from walking on the side-boards. Here is a closeup of the shell vs. no-shell on the court. I wish I could have had more time before the rain because the part of the court with the oyster shells made it through the heavy rains with no problem. The rest of the court now needs to the groomed again before putting on the shells. I bought one extra bag just to make sure I have enough shells. 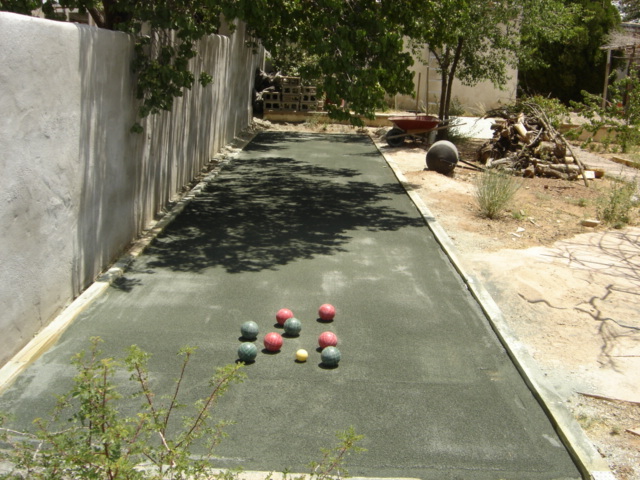 It's really starting to look like a bocce court. I can't wait to play! I've spread the other 4 bags of crushed oyster shell, dragged it and rolled it. The bags were left out in the rain so the shells were still wet. It's alot easier to spread them out when they are dry. I have one more bag of oyster shells left. I'll use this when necessary. The neighbors have been a bit curious and even asked how the 'runway' was coming along...as in 'airport runway'. Education is half the battle...I expect to be teaching quite a few people how to play. UPDATE: The court was playing too soft for my taste so I mixed in a top layer of oyster shell flour. I used one bag per 100 sq. feet. I mixed it into the top layer of sand and oyster shells. I dragged it so it would be even, rolled it flat and waterred it down. The court is much firmer and now plays much faster. July 2009 Update: So the court is still standing...I haven't added much to the court since my last update except for a couple of oyster shell bags and flour last spring (ya of 2008). I probably should have done more this year but never found the time or motivation. We had an extremely wet winter and a colder spring (and summer) so far. After using my wide push broom to sweep out the debris (leaves, needles, tan bark) it was helpful to reposition some of the shells and flour, roll it and wet it down. Boy, does that make a huge difference! It was ready to play within an hour! 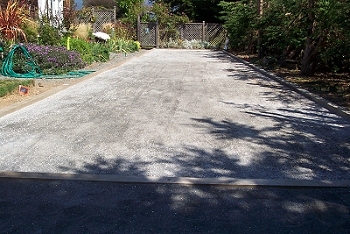 Here's a shot of how the iBocce court looks today. I'm standing where we used to have an apple tree (that never gaves us good apples) that is now a basketball sport court. You can compare the court to some of the earlier pictures above...it has held up quite well for over 6 years old! 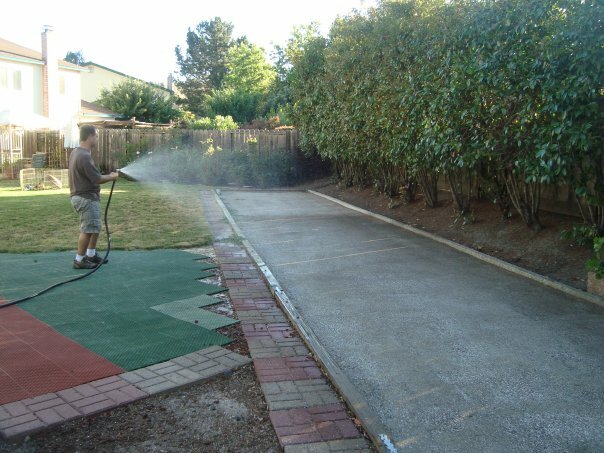 Bryan wetting down the iBocce court in July of 2009. One of our builders, Steve, found Oyster Shell Lime (Flour) on the west coast that delivers. He passed it along to me and I want to do the same since its sometimes hard to find at your local feed store. Go to GrowOrganic.com and type in "Oyster" in the search box...you'll find a few options, but your looking for "Oyster Shell Lime (50 Lb)". 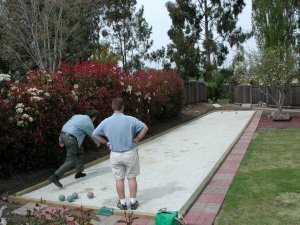 Details: They have 50lbs bags available below $10 each and a decent shipping price.Please mention iBocce.com when ordering!! 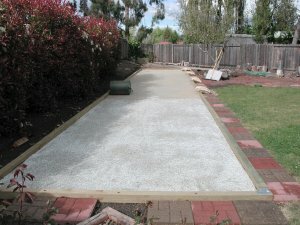 Buy the plans to build your own 'iBocce Court'! The plans include descriptive detail on all the steps you see above and more. Also includes personal notes on the construction process and insight on landscaping and maintaneance. 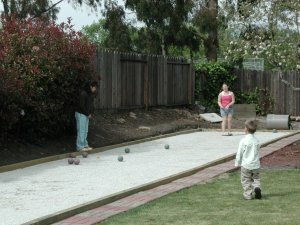 SHOW US YOUR OWN IBOCCE COURT! 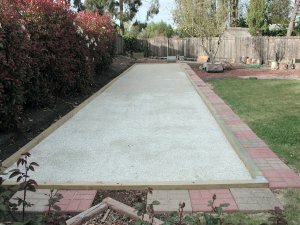 Bocce Party Court - San Jose, CA I was under a time constraint due to wanting to build it before my oldest daughter's high school graduation. So I got help from a contractor. I knew what I wanted and bought all of the materials myself before hand. My son and I prepared the area before they arrived. That was the hardest work as it was all dead grass and bark from a previous play structure I built for my children 10 years ago. The court is only roughly 40 x 61/2 feet. Which is extremely small but I have to say that all our friends love it and think our house is definitely the place to party! It took the contractor 2 days to finish it. We have 4 to 5 inches of gravel with another 2 inches of gold fines. Then I added the final 1/2 inch of oyster shell on top. We did lay out a series of pipes that led to a french drain so the water wouldn't build up. It's been working really well. I have to tell your readers to go for it. It's not hard to build and gives us and our friends so much pleasure. It's definitely worth the effort! 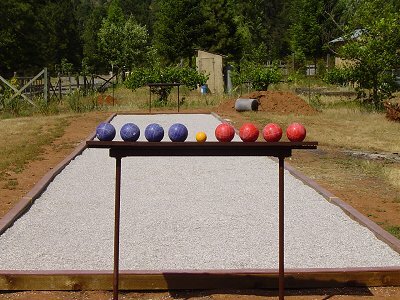 Bryan's Comments: Could you ask for a better view from this bocce court in the pines?? Tom, please e-mail me more details of your court and I will post...I'm sure people would like to know. When can we play?! She was christened on July 4th. Thank you for your wonderful plans which served as a great guide line for our court. The court measures 59 1/3' X 12'. I doubled up on the end boards to better contain any bouncing effect. 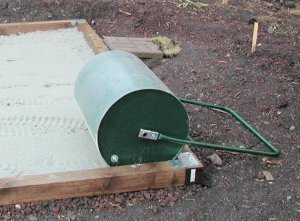 I used almost 4 yards of masonry sand, 7 bags of crushed oyster shell and 4 bags of oyster flour. I have extra to help maintain the future of the court. Bryan's Comments: Wow, this court looks great! I like the extra height of the backboards, I'm about to do that to my own court. That is a beautiful spot for bocce. 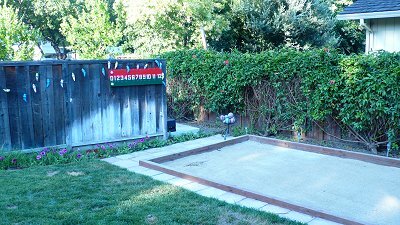 Hi - here is our Backyard Bocce Court. 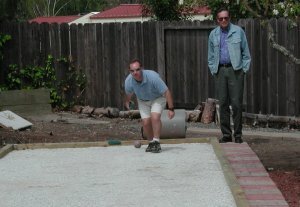 We had some cement work done on our backyard so while we were at it we had them pour a curb. The court measures 50' x 10'. We've has some great parties that both young and old enjoy. We've installed lights, speakers and score balls on the arbor, it has been a perfect addition to our backyard. As you can see we have some problems with our neighbors trees. They drop very small leaves and needles. Any ideas on how we can make a drag to pick up very small debris? Also where can I find Oyster Shell Flour here on the west coast? We live near San Jose, CA. We originally used oyster shells that we purchased from a local feed store, and they are more like shells instead of powder. The court plays very soft (it takes more to roll the ball a certain distance than it does on other courts we have played on-but this may not necessarily be a bad thing given the small size) and we have been challenged to keep it level. On the other hand the court is purely recreational and we don't want to spend a ton of time grooming it. Thanks for all the info on your great site. It gave us incentive to put in the court and we have enjoyed from day one! Bryan's Comments: This is an awesome looking court. The cement makes it look professional. Contact your local Feed/Horse Tack supply store for the oyster shell flour and mix that in as your top layer. What a great party attraction! Don't be afraid to cut away branches that hang over your fence...it's within your right to do. I'm so glad I could help inspire you! Bryan's Comments: Wow, this reminds me so much of my own court after I just put down my fresh bags of crushed oyster shells. This is also a great Father/Son project. I hope many rafters and kayakers get a chance to play! "Here's my finished court, which is a little on the short side at 8 x 50. (All I had room for. Little kids and drunks of all ages will appreciate the short-court advantage, I hope.) The directions in your book were very helpful. 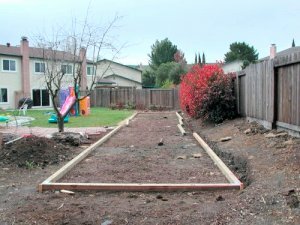 I'm writing an article about building my own court for the online magazine Slate (www.slate.com), and I'd like to hear from other people who are trying it. I'll plug your book. Click here to read Alex's article on Slate.com! 1. It was quite a bit more labor-intensive than I anticipated, but that's because I had to build my court into a slope. By far the hardest part was digging and moving about 6 inches of hard clay soil that had to be removed from half the court's area. I also had to wheelbarrow everything from front driveway to backyard (no access). With the amount of volume involved, it adds up to be a lot of work. 2. I found that crushed oyster shells, by themselves, don't make a base that's fast enough when sprinkled over a bed of sand and crushed granite. I was unable to find or order oyster shell flour anywhere, so I definitely had a problem on that front. If I hadn't lucked into finding tennis court clay for a bargain price ($150 for 100 80-pound bags ... I used around 50 and may sell the rest), I would have had a problem. 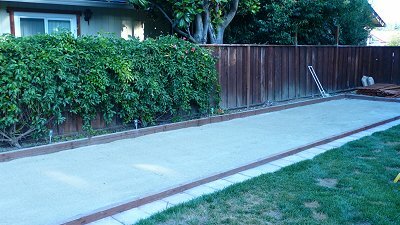 There's a bocce-court supplier in Washington State that will sell you a pre-mixed yard of crushed shells and flour, but to have that plopped onto my driveway would have cost $1,250." Bryan's Comments: I like the way the tennis clay works on your court. It looks very nice. Yes, I've been getting quite alot of inquires for Oyster Shell Flour. It seems to be hard to find except for the west coast. I will do some research and try to post some places where you can find it or order it. Great job Alex and we'll be looking for your article on Slate.com! "The court slopes 3inches in its length. I did not want to try to level it after removing 720 sq ft of sod! Can't notice any advantage rolling downhill or any needing extra oomph to roll uphill! 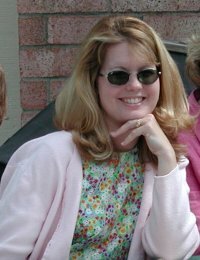 I was 70 in March. Took me one month to do the court including cutting down the trees. 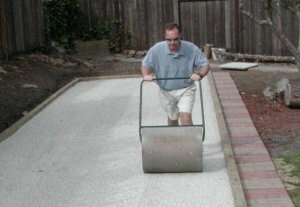 My wife and son helped with the sand and shells, I manned the roller. 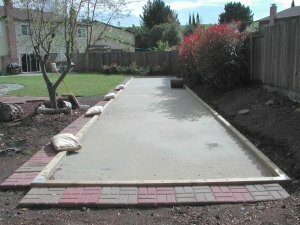 I'm going to put pavers at each end and finish the path. 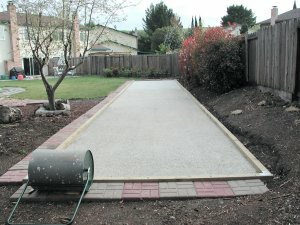 The total cost of the project was $779.00 including your instructions. Prices are higher here in Humboldt County. I am using Italian flags to mark the center of the court! Also, the brackets holding the 4 x 4s are painted green white & red! Needless to say, even with a French last name I am Italian! My mother was from Italy & my dad had relatives in Italy. Going to give our four year old granddaughter a lesson right now! Bryan's Comments: Looks like a great court! Reminds me alot of my court the first few days after I finished it. The Italian flags at center court are a great touch! The First Roll: Let the games begin! 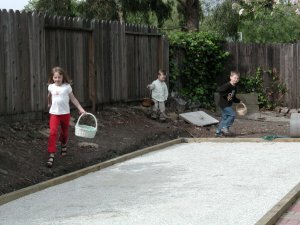 while building the iBocce Court.